Today is the day! I hope you have or will get out there and exercise your right to vote today. Jeremy and I got up and got it out of the way first thing, I hate to say it that way but honestly I'll be glad when this is all said and done. I'll be glad to see a lot less political Facebook posts and I'll be glad to hear less ranting and raving and I will be especially glad to hear less hatred toward one political candidate or the other. It's sad how childish adults can be. 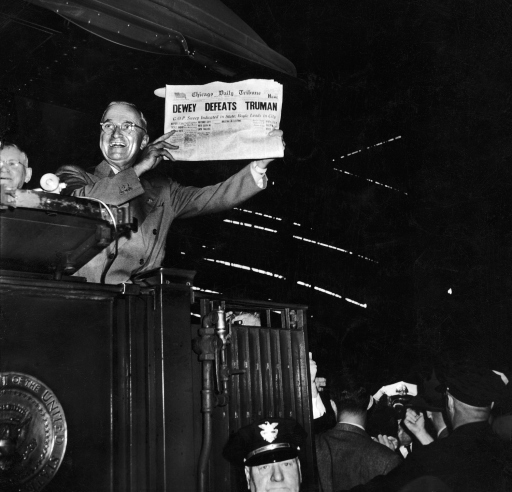 1948, Truman holds up a paper with the erroneous headline, "Dewey Defeats Truman"
1950, Florida State Senator Claude Pepper and his wife nap on the plane on their way home from campaigning. 1952, Taft seems to begrudgingly hold a rooster during his primary campaign. 1964, supporters of Berry Goldwater cheer him on. We know how all those elections end, after today this one will be history too!